Are women and men “victims of fashion”? Does what we wear, define who we are? In the world of fashion, how much is too much or when is too little, well, beyond revealing? Beau Brummel’s signature cravats, Joan Crawford’s and Joan Collins’ exaggerated shoulder pads, Carmen Miranda’s platform shoes and fruit bowl turban and Henry VII’s black squirrel collars: all speak of excess. Tight lacing, foot binding, penitential black and the minimalism of Jil Sander generate questions about the restrained, fashionable body. Fashion’s willing victims, whether past or present, give us pause to consider whether clothes can ever be too tight, too loose, too high, too low, too opulent or too modest. 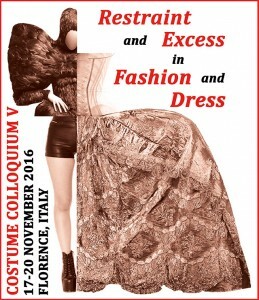 Costume Colloquium’s fifth edition “Restraint and Excess in Fashion and Dress” to be held in Florence, Italy in November of 2016; will highlight historic, geographic, psychological and sociological accounts of restrictions imposed by dress codes and sumptuary legislation: who has the right, or not, to be extravagant, who can trim with lace or embellish with gold? Additionally, we will delve into the showy counterpart to an equally intriguing set of questions about the strict limitations imposed on those who wear, make and indeed, sell military, legal, religious, national and ceremonial dress. The language used in fashion retailing, journalism, promotion and exhibition is understandably often extravagant and excessive, with clothes and their designers described as outstanding, incomparable, exquisite and ingenious. However, a discourse of restraint that speaks of understatement less is more, functional minimalism and versatility is equally familiar. Costume Colloquium V will provide a forum where both of these languages can be heard and establish a dialogue with one another. Other topics will include a look at fashionable restraints that cause physical distortion of the body, fashion that can be detrimental to our health, and garments that bind us and limit our freedom of movement. Discussions regarding fashion on display on stage, on runways, in store fronts and in museums will examine the trends of making fashion accessible to a globalized consumer. Costume Colloquium V will address the relationship between liberation and confinement, display and concealment, and present an analysis of styles, including: hemlines, waistlines, necklines, embellishments and accessories which should help to illuminate us about the why, where, when and how fashion can be, in fact, a guiding force for us all.